When I was 14 years old I had an unexpected encounter with God. At that time I had just given up on my dreams of becoming a professional skateboarder (because I could only do one trick), and to be honest, Jesus was becoming more interesting than mastering a kick flip. One afternoon I was hanging out at a friend’s house when my mum called. She asked me to come home quickly as a large thunderstorm was on its way. I hopped on my bike and rode as fast as I could. I shot along a wooded path that led to the mouth of a lake and as I came out of the woods, with the lake before me, I was confronted by a huge wall of black clouds. I stopped and dropped my bike, mesmerized at the sight. Caught between two worlds, behind me was the sun shining down illuminating and magnifying the green and blues of the trees and lake. The colours vibrant as they stood against the black storm rolling forward. Lightening flashed as the temperature plummeted and the wind picked up. I was all alone standing in the path of the mighty storm and I felt peace and fear all mingled together. I remember praying into the wind, “God who are you? I am tiny and insignificant and you are powerful.” As I said this simple prayer I could feel my faith grow as I realized that God is not to be contained in my small boxes and imagination. I jumped back on my bike and got home as fast as I could just missing the rain. Decades later I would receive the news that I was to go forward to train as a vicar. 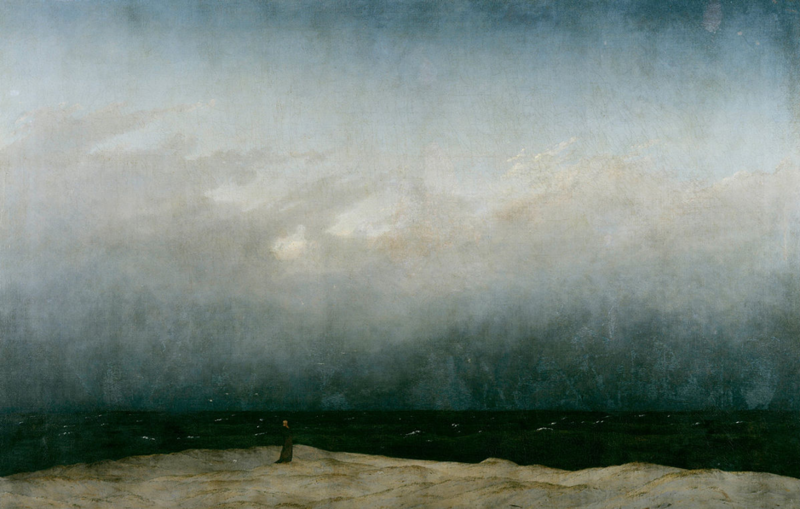 To celebrate, my wife bought me a picture by Caspar David Friedrich called ‘Monk by the Sea’. It encapsulates that formative experience where my faith grew as I experienced God in the storm. Though my faith has taken twists and turns I remain a servant of one who I cannot contain but dearly love. I wonder where you might unexpectedly see God today? Why not pause now to take in the painting below, and invite God to expand your understanding of Him today? John is a pioneer ordinand training at Trinity College Bristol. John is married to Pipps (who is also training for ordination), they have two children Zoe and Will. Though he hails from America he is a citizen of the UK but is unable to do a British accent. He loves movies, literature, traveling, and music.